I am always amazed by how generous people are. We are lucky at S2C that we are supported by so many generous people who give. When we talk about giving to a charity people always seem to assume it is about giving money, always nice and helpful, but not everybody has money to spare. To be honest giving in this form is probably the smallest way people associated with S2C give. Giving, is, I feel a very important element of being part of the community. It is to be noted that the five ways to well-being, those five things recommended you do to keep your mental health good, has giving as one of its strands. And by giving we mean all sorts of things. At S2C that giving takes so many forms beyond dropping some change in the donation box or writing out a cheque. One of the biggest gives is time. Those people who volunteer their time to take on the jobs that keep s2C going. That might be a big commitment over several days or just an hour here or there. It all counts. From those that run sessions to those that clean, those that support service users to those that go off to shows and events, those that run sessions on the hospital ward to those that look after accounts. All giving time to help people. Some people give to S2C donating materials. Many artists give us resources and equipment, things they don’t need anymore or have too much of, things they have bought for us or are left over from a project. Some people donate advice, taking opportunity to support us by giving advice and information we might otherwise have to pay for. Some people give us opportunities. Making space for us at events or including us in meetings, that kind of thing. Some people give by promoting S2C, from a simple share on Facebook to telling people they meet about what we are doing. 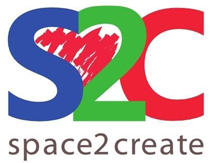 Space2Create always needs people’s help. Now more so than ever as we look to exciting new projects ahead and ever-expanding what we do. We can only do that with the support of our volunteers and the people who give things so generously.